Yokohama Dragon Fruit Ale is a 5% fruit beer from Yokohama Brewery, based in Kanagawa, Japan. It’s part of their limited seasonal range and was first released in 2016. 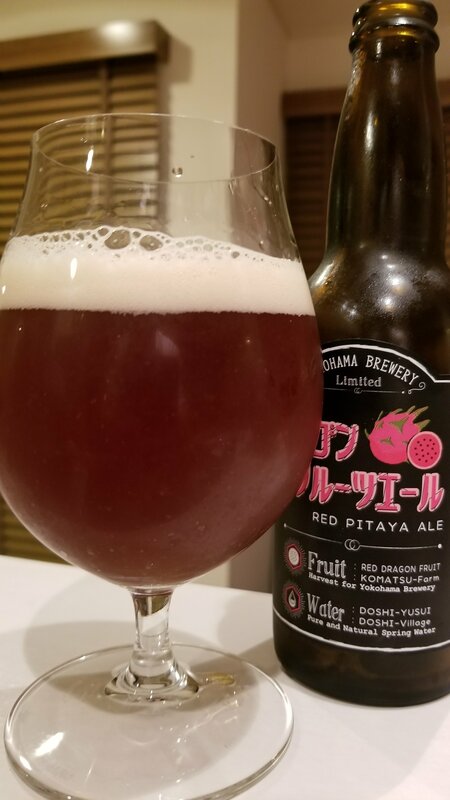 Yokohama Dragon Fruit Ale, also known as Yokohama Red Pitaya Ale, uses locally sourced dragon fruits and water from the Yokohama area. At the time of writing, it’s unknown if Yokohama Dragon Fruit Ale is an annual release or sporadic. Yokohama Dragon Fruit Ale poured out a dark ruby red colour with a slight reddish-tinged head. The aroma was slightly fruit, with a gentle hint of acidity and dragon fruits comin through. There wasn’t any discernible beer flavour coming through though. No malts or hop aromas – a shame really as those ingredients have been wasted now in making this beer. The body was pretty much more of the same. Large dry fruity flavours coming through of dragon fruits, and a slight bitterness to it. I guess if Yokohama Dragon Fruit Ale had been mixed with some soda water or lemonade, then it would be a good summer drink. But winter? Not really. It all ended up of being a fruit juice with alcohol added to it, rather than being beer having some fruits added to give some extra flavour. If you like dragon fruits, then Yokohama Dragon Fruit Ale is worth a try. Else give it a miss.